Although the original goal for my blog was to periodically share information with congressional staffers and journalists, the audience has expanded and the site has now become the primary outlet for my work on public policy. And today is a milestone of sorts since it is my 5,000th column, something I would not have predicted when I posted my first entry back on March 29, 2009. So that gives me an excuse to update the readership data from 2015. Back then, based on visits as a share of population, I noted that I was most popular in Washington, DC. Though perhaps “most popular” would be the wrong term since I’m sure some readers from that corrupt city do not like my message. In any event, those numbers were not surprising since DC is filled with people who work on public policy, so they have a reason to read my work. And I also wasn’t surprised that Virginia as in second place since that’s the home of many people who work in DC-related public policy. 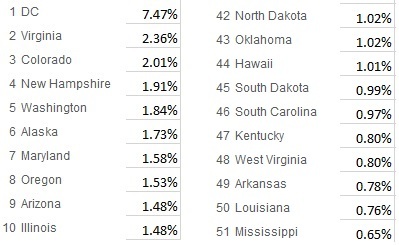 And that hasn’t changed based on these updated numbers showing where I get the most readers and fewest readers. For what it’s worth, I’ll make the claim that Colorado is the most libertarian-leaning state based on this data. The folks in the Centennial State read my writings without having a work-related reason. So I hope they all paid close attention to my column about TABOR. And New Hampshire would be in second place based on that analysis, which probably isn’t too surprising since it’s the home of the Free State crowd. The data on international readership is even more interesting, in part because I have access to data on both visits and page views. Here are the numbers, both expressed as a percentage of the jurisdiction’s population. The most striking result is that Vatican CIty (which wasn’t even in the top-20 three years ago) is where I have the highest percentage of readership. Though I definitely don’t think this means “most popular” since my columns about the economic views of Pope Francis have been less than flattering (see here, here, here, here, and here). 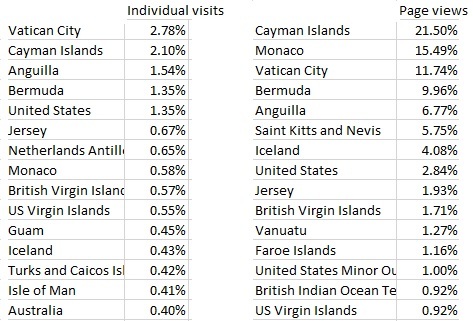 Measured by page views, however, the Cayman Islands and Monaco take the top two spots. Given my work on tax havens and tax competition, I’m guessing that these readers actually like my writings. Indeed, you’ll notice that “offshore” jurisdictions are very well represented, whether based on visits or page views. The second-most striking result is that Iceland appears on both lists and even ranks above the United States for page views. In my fantasies, I’ll assume the striking women of Iceland are avid readers. In reality, it’s more likely to be the burly fishermen. Another odd outcome is that there’s a high level of page views from the Faroe Islands. Are they big fans of their private Social Security system? My writings on Australian pension reform may also explain the high level of visits from Down Under. Since I’m writing a narcissistic column today, I’ll close with by sharing my recent interview with “Spanish Libertarian.” He asked several very good questions about the challenges of trying to expand freedom. P.S. There are some places where people don’t appreciate my work. I’ve never had a single visit or page view from Niue, Norfolk Island, Svalbard, or Tokelau. Given the very small populations of those obscure jurisdictions, I’ll try not to take it personally. Oh, and I’ve also never had a visitor or page view from North Korea. But I’m assuming that nation’s totalitarian government blocks access so citizens don’t get exposed to this or this. P.P.S. I’m no Cal Ripken or Lou Gehrig, but I have a personal streak. I’ve written a column every day since November 10, 2009. I realize the world won’t end if I skip a day, but maintaining this streak is a way of forcing myself to stay productive. Now I have to figure out how to be effective. First of all please allow me to congratulate you on this amazing milestone! I read most of your blogs and use them as inspiration for my podcast. You can find earlier podcasts on http://www.hofprofit.com/podcast where you can also take a completely free subscription. I’m wondering if you would give me the honor of an podcast interview to debate your viewpoints and why taxation and government spending are bad and free markets are functioning well and better. The interview would be a recorded Skype conversation and just a friendly talk. Great job from Indiana! And I have flown my airplane to Svalbard, true not many people there. You do yourself an injustice about our Superannuation scheme being the reason you get a goodly number of visitors from Australia! You get people like me reading you most days as you are a beacon of common-sense and a great source for ‘not many people know that’ conversations as we throw another shrimp on the barbie. Great post, great interview, made my day. Happy anniversary on your 5000th post! …and thank you Dr. Mitchell for having the most prescient to long term prosperity blog in the world. I think that by virtue of the law of probabilities Americans will not take your advice in general. I see too many European winds amongst modern American voter-lemmings, especially the younger generations. But your writings are here — to perhaps one day be serendipitously picked by some jurisdiction where a majority of voters see the long term prosperity in your views. If not, then democracy faces a grim future of decline — and thus inevitably extinction. No democracy with a growth rate inferior to average world growth rate will survive. That is simple arithmetic and that arithmetic currently covers most advanced democracies. PS. On your interview, on utilitarian vs moral libertarianism, there may not be that much of a difference. Through (human and cultural) evolution cultures and biologies eventually internalize high growth and prosperity ideas and behaviors. Therefore, with time, these growth mentalities become instincts and morals. And therein exactly lies the problem. This type of evolution has a lot of inertia. And inside our genes is the inertia of having lived as humans in a static world for hundreds of thousands of years, a world with virtually zero growth and progress, a world where obedience and attachment to the tribe (and its government) indeed yielded the best personal and societal result. That has changed in the last few hundred years but the inertia of the previous millennia is still baked in our genes. That is why the various forms of coercive collectivism are instinctively appealing to most people, because they are baked in our high inertia genes. In my view the most empirically effective bypass of this inertia has been religion (though I’m not religious myself) hence important interactions such as “The Protestant Ethic” (see Max Weber). PPS. One of the questions in the interview was essentially “why do we get so many smart politicians that are leftists (or coercive collectivists)? One reason is that we, the electorate, rejects those smart politicians that are not leftists, or more generally coercive collectivists. The second major reason is that the essential core product of a politician is coercive collectivism, almost by definition. So, of course politicians become a self selecting profession of people who believe in coercive collectivism. There is no profession in the world that can effectively promote, advertise, and admit its own redundancy in a sustainable manner. PPS. Globalization is simple: Globalization of competition and the free movement of goods, services, capital, and people is good for humanity — increases compounding growth. Globalization (as in homogenization and harmonization) of laws, regulations, and culture is bad — diminishes growth. PPPS. NO country will remain rich (that is remain in the most prosperous group worldwide) with a growth rate that is significantly lower than the world average growth rate — and that includes virtually all the advanced welfare democracies. Simple arithmetic. I’m your new libertarian reader in Vanuatu, a country with minimal government, few taxes, no wars, little violence, much freedom, and good, happy people. You’re preaching to the choir here. Keep up the good work, because the rest of the world needs what we have here – liberty. Wow that’s just brilliant…I truly didn’t think there would be such a huge percentage of your readers from Vatican…that’s curious indeed. I’m in Mexico and I read your column. How come you left me out? Thank you for your original analyses and even tempered approach! Looking forward to reading future columns. Truly, a tour de force and very cool. Good job! Thank you for keeping this low-ranking Treasury staffer thinking.